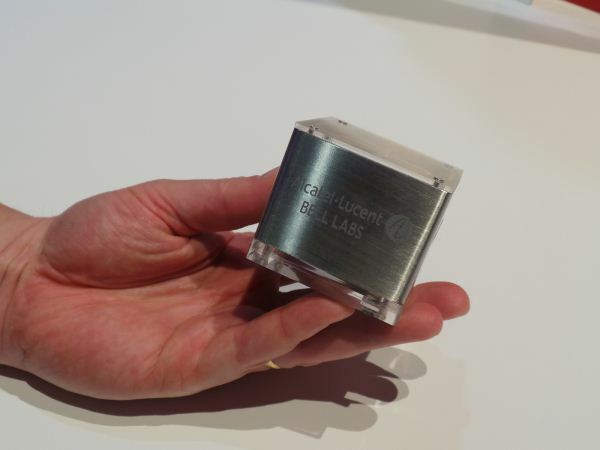 I dropped by Verizon's booth at CES 2013 and among all the consumer electronics and devices that we've pretty much already seen before saw one new thing — Alcatel Lucent's small cell based on the LightRadio project. What we're looking at is a Cube Dock 2600 radio head which contains the antenna, RF components, power amplifier, and is designed to work in conjunction with fiber backhaul that ships that downcoverted RF to a baseband in a datacenter somewhere or to a centrally located rack for processing. These are small cells that will radiate around 250 milliwatts of power, with one band per radiohead. The idea is to do LTE Band 13 on these in trouble spots on the operator's network. The Cube Dock 2600 will be deployed by Verizon starting 2H 2013 to do what amounts to hole filling in the operator's network. That is, deployment in small dead zones such as under a bridge or inside a mall that's still too small or under trafficked for a DAS (Distributed Antenna System) or urban environment. The unit itself, maybe under $10. Article mentions the need for a fiber link to a remote facility to house possible 1U (I added this) or more of support equipment. Might end up costing a carrier $30k to deploy with licensing, labor, adding gear, space rental on buildings since you really can't have gear on poles in most places. It will not be cheap compared to what we might be thinking. But this is great for phone retail stores (people can run benchmarks off a local cell lol. Either way this device is cheap compared tot he cost of putting up a more common carrier pole which run the price of a small home (California prices).